On Sunday morning Kit and I were up early and leaving our bags in the hotel reception to collect later, we took a taxi to Philae Port. I had been to Philae several times before, but only with a tour group, so this visit was a journey into the unknown, because from the port we had to negotiate for a motor boat to take us to the Island of Agilika, where Philae Temple rose above the glittering waters of the widest part of the river like a magnificent vision. It was still early and we were lucky that there were few tourists about so that the competition to take us was quite fierce. We negotiated a fare of LE30 for the boat to take us to the island, wait for a couple of hours and bring us back. I didn’t have any idea what the going rate for this trip should be but we were happy to pay what was asked. There were no groups on the island at this time of day and for once the temple was almost deserted. It was bliss to wander the vast columned halls in peace, taking our time to study and photograph the reliefs. To our amazement our boatman was still there to take us back to port when we were ready to go (I had heard stories of people being abandoned on the island). A taxi back to Aswan took us to the bazaar and we walked along the main street looking at the brightly coloured stalls. I bought some spices, one of the things Aswan is famous for and Kit bought some trousers, a Nubian hat and a darabuka, the kind of Egyptian hand-drum he had seen played on the Corniche. We then spent an hour looking for a suitable bag for the drum, eventually finding a perfect hand-woven bag in a fixed-price shop at the end of the Suq. By now it was lunchtime though we seemed to have already done so much. 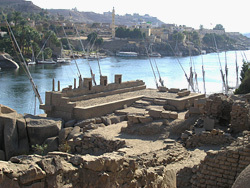 After another half hour searching for a small temple of Isis that I was destined not to find for many more years, we found ourselves at the southern end of the Corniche, so I suggested we go to the Old Cataract Hotel for lunch on the terrace overlooking the ruins on the Island of Elephantine. It was lovely to sit there with a band of Egyptian musicians playing in the background like an old fashioned palm court orchestra and I could have happily spent the rest of the afternoon there, but Kit wanted to take another felucca trip. Walking back along the riverfront we met Captain Nasser from the previous day and had an hour sailing on his boat ‘Greenland’ – this time in a more relaxed mode as the wind was not so strong. The songs of Bob Marley, as heard on an old tape player on a felucca, will forever remind me of a chilled-out afternoon on the Nile at Aswan. The sun was setting over hill of Qubbet el-Hawa as we ate an early dinner in a riverside restaurant named, for some reason, the Mona Lisa and after calling at the hotel to collect our bags we made our way to the railway station. Aswan Corniche is quite long and we must have walked miles along its uneven pavements in the past two days. The train was only half an hour late and we arrived back in Luxor at 11.30pm, a time of night when the streets are still busy. It had been a lovely weekend away, but Luxor was home and we just had to call in at the Amoun restaurant for hot chocolate before making our way back across to the West Bank and the Gezira Hotel. Once again Kit and I had made use of our ISIC cards, this time to buy half-price train tickets to Aswan, splashing out all of LE 15 (about £1.50) to travel first class. We were at Luxor railway station bright and early to catch the 6.30am train, which for reasons unexplained, left Luxor at 8.30am, and arrived in Aswan three and a half hours later. We hadn’t booked a hotel so we had to spend the next hour or two trawling the town for a cheap place to stay. These were few and far between, and we looked at several dismal places before eventually settling for a small Egyptian hotel called the Philae, on the Corniche. This was very basic but reasonably clean and relatively inexpensive. The nicest thing about my room was the little balcony with a beautiful Nile view and I didn’t discover the downside of noisy all-night traffic until much later. We dropped our bags and went straight out to explore. My long-haired ‘hippy’ son immediately felt at home in Aswan. The town is much more laid back than Luxor with reggae music coming from every riverside cafe and Rastafarian guys with their dreadlocks and multicoloured oversized hats, sitting in groups on the pavements playing drums. Kit would have sat down to join them but I managed to lure him away with the promise of a felucca trip, my ulterior motive being to cross to the West Bank tombs. We struck a deal with a captain called Nasser on his felucca called ‘Greenland’ and he took us over to the opposite bank where the sand-covered hills are strew with the rock-cut tombs of high-status officials of the Old and Middle Kingdom I didn’t count the steep steps leading to the upper level of the cemetery – but there were a lot! Beginning at the southern end of the upper terrace we visited the six tombs which were open to visitors, these mostly dating to Dynasty VI, a period that is poorly represented for accessible decorated tombs. They were badly preserved but quite different from the New Kingdom Luxor tombs, so were well worth seeing for their fine examples of hieroglyphic texts detailing the careers of their owners as well as scenes of daily life in the earlier periods. My favourite tomb and probably the best preserved, belonged to Sarenput II, Overseer of the Priests of Khnum and Commander of the Garrison at Elephantine, dated to the reign of Amenemhet II of Dynasty XII. In his colourful biographical text I found an unusual hieroglyph of an elephant, which I had not seen before. Perched on the top of the hill above the ancient cemetery is the domed tomb of a Muslim prophet which gives the hill its local name, Qubbet el-Hawa or ‘Dome of the Winds’ and which can be seen from just about all over Aswan. Having accomplished my mission and worn myself out climbing up and down those sand-covered steps and into the deep tombs, we were back on felucca ‘Greenland’ for a trip around Elephantine Island. Kit was now in his own element (i.e. on a boat) and he had found a kindred spirit in Nasser. While I lay back on the bench cushions for a nice relaxing sail, Nasser and Kit competed with each other to see who could steer the boat closest to the rocks around the island, veering away at the last minute without actually crashing into them. There were one or two very close calls and my goodness, I hadn’t realised that feluccas could move so fast! Nasser dropped us off at the northern end of the Corniche near the Old Cataract Hotel because we wanted to get to the New Nubian Museum before it closed. We had hired Nasser’s boat for over three hours and it had cost LE 60 for two of us for a really lovely afternoon. I yet hadn’t been to the new museum, which was opened only last year, in 1997 and it was well worth seeing if only for its beautiful Nubian-style architecture, nestled into the hillside. The site covers 50,000 square metres of landscaped gardens which are divided up into different sections with many outdoor exhibits. Inside the museum a flight of stairs leads down from street level to the entrance of the temperature and light controlled exhibition space, with an 8m high sandstone statue of Rameses II as the focal point. We were led by informative history boards around the exhibits in a chronological order, beginning with the Prehistoric, through the Pharaonic era to Graeco-Roman, Coptic and Islamic periods of art. The exhibition space itself was airy, well-lit and almost empty of visitors, but we had only two hours before the museum closed, not nearly enough time to see everything. Kit and I were tired but we both felt that we had had a very productive and enjoyable day. We walked back along the Corniche to our hotel, stopping to eat in a riverside restaurant while looking out over the inky river towards the now-floodlit sand dunes of Qubbet el-Hawa on the West Bank.